My designs have been featured in numerous international media, awards, and collections. View them by project below. 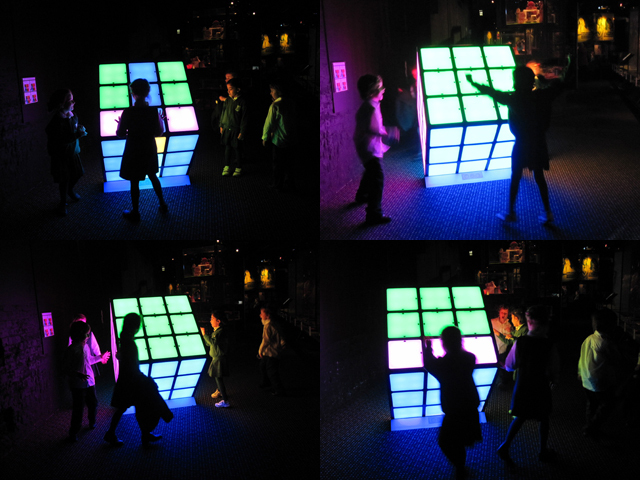 R&D of a new interactive lightbox technology used in the Giant Interactive Rubik's Cube. Involvement in the creation of a new 2-way mirrored digital projection film used in the Music Cube. Involvement in the design and production of 5 interactive experiences. 22. Flickr: Ben ho . Developing new play styles that automatically trigger parents to engage their children in learning. The exhibition has attracted 200,000 visitors with an extended running time since 2012. Design and production (from research to installation) of unique interactive experiences that made the widest range of story elements of The Wiggles brand accessible in one place. Implementing principles of Children's Philosophy in the design of interactive experiences to guide curiosity in story development. Design and production and assisted production of 12 unique interactive experiences. 3. Minister of the Arts: Powerhouse Museum celebrates 25 years. much-loved institution unlike anything seen in Australia." Pose for the camera at a virtual VIP Fashion Party, then publish them. Design and production of Mixed Reality environments using interactive video and photography, as featured in the VIP Room's Fashionista Table, Backstage Hair and Make-up Mirrors. The Bupa Magic Garden is about "Healthy Eating and Healthy EXERCISE". Design and production of the Magic Garden and its 13 unique interactive experiences with the Department of Interactives' R&D team. Design Thinking and creating a branded user experience. Magic Garden became the Museum's flagship exhibition for 6 years and grew to become a regular attraction in Sydney. The design balanced block buster shows (eg Star Wars) equally in crowd density during shool holidays. University of NSW recognised using children’s philosophy as an exploratory learning tool in interactive media as an innovation. The exhibition was considered by the Museum as a world first in design and the way technology was used to communicate a health theme. Design and production of an innovative floor tiling system seamlessly integrated all interactive experiences by hiding and channeling the electronic services to them all. R&D of new interactive light box technology. 4. Life is in the small things. interactive shadow puppet show teaches kids mechanism design. Successfully turned mechanism concepts into a robust, vandal resistant system. R&D of new ways to create depth and a 3D scene using only mechanical means, films and materials. Development of a new transparent lightbox technology to illuminate the 3D scene. 1. Who made this exhibition? 2. City of Sydney: What's On? an installation of a constantly-changing maze of mirrors and light boxes. Assisted design, prototyping and production of the immersive gallery. 3. Powerhouse Museum and about the "immersive"
New display technology inspired by the film "Minority Report" - developed for the Engineering Excellence Awards 2011 Exhibition. Innovation of interactive holograms inspired by the film Minority Report. Translation of mathematical and scientific theories into vandal resistant demonstrators. Design and production of numerous interactive showcases and their technologies. R&D of new lighting technologies.